In the early 20th century many roads in Montana were constructed by convicts from the state prison in Deer Lodge. The Warden believed that manual labor not only taught the men a skill but also increased their self-esteem and reduced the chances they would later return to prison. When created in 1913, the Montana Highway Commission had no money to build roads. Instead, they funded “demonstration” projects which often used convict labor. The state paid 50¢ a day for each convict, while the counties provided the equipment. About a third of the penitentiary’s 600 inmates worked outside the walls building roads and bridges throughout western Montana. This road was constructed by convict labor in 1913 and 1914. About 111 prisoners worked on the road and lived in two tent camps. They enjoyed a measure of freedom not present in the prison. The food was generally good and the men were treated to evening band concerts performed by their musically inclined comrades. Despite this, thirteen men fled the camps; all were eventually recaptured and returned to prison. Built entirely by hand labor with horse-drawn scrapers and graders, the road cost $31,825 when completed. This was the longest section of road built by convicts before the program ended in 1927. 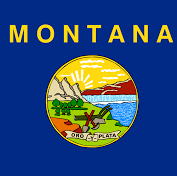 Although upgraded over the years, the highway retains the same alignment established by Montana’s convict laborers before World War 1.